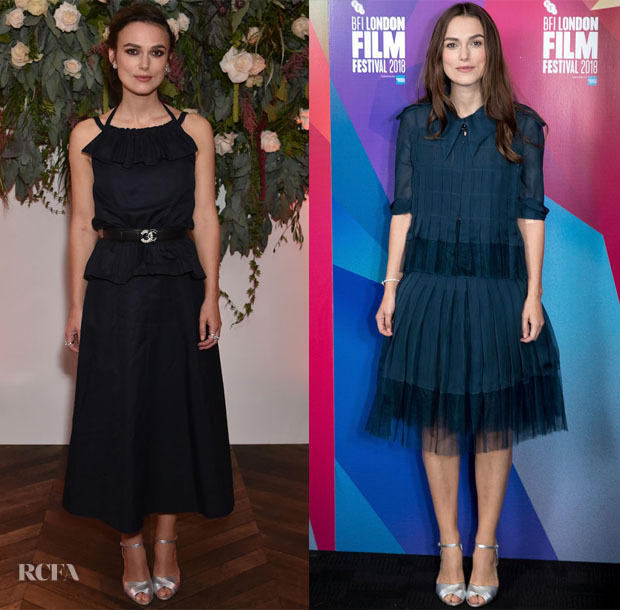 London Film Festival Patrons Gala: On Thursday (October 11), following the premiere for ‘Colette’ during London Film Festival, Keira Knightley attended the Patrons Gala, where she wore another Chanel look fashioned with a retro-inspired silhouette. It was a very elegant choice for evening. I love how the demure dress is given a lift with her silver Tabitha Simmons ‘Kali’ sandals and classic CC Chanel belt. BFI London Film Festival ‘Screen Talks’ with Keira Knightley: The following day (October 12) Keira rocked her third Chanel dress in two days. What I loved most about her premiere look, is that the silhouette and style felt very different, despite still being from Chanel. On this occasion the feeling of familiarity was apparent, but you can’t deny that Keira always possess a sense of girlish charm that is very captivating. Chanel jewels including the ‘Sailor Suit’ bracelet along with the silver Tabitha Simmons ‘Kali’ sandals once again, completed her look.